Shades blend form and function to deliver superior benefits and a variety of solutions for every St. Louis, Missouri home. Choose from a wide selection of styles that offer precise light control, easy operation, and protection from excess heat, glare, and UV rays—all available in a wide range of colors and materials. Graber shades offer numerous benefits and a large selection of solutions that is guaranteed to create the right aesthetic for your St. Louis, Missouri home. Decide on factors such as light control, operation systems, as well protection from heat and glare. All variations of Graber Shades are offered in a variety of colors and materials. Learn more about Graber Shades and window covering solutions for St. Louis, Missouri. There are solutions for all window shapes and sizes, our specialized and friendly consultants can point you in the right direction. Learn more about Cellular Shades. Layered shades are modern and offer multiple levels of light control. Choose between multiple alternating sheer and opaque fabrics. The fabric blocks up to 99% of UV rays which protects your furniture, wood, and other interior items of your home. The layered shades can be paired with continuous-loop lift or motorized lift options, giving you complete control over the functionality of your shades. Learn more about Layered Shades. Natural shades by Graber completely transform your space into a relaxing and comfortable area. Multiple material options including bamboo, reeds, grass and jute are renewable material options that make a statement in your home. Transform your space and create a aesthetic that sets the tone for your home. Lightweight-woven materials offer great light control and lasting impressions. There are a multitude of control options including cord, cordless, motorized and continuous-loop lift systems. Learn more about Tradewinds® Natural Shades. 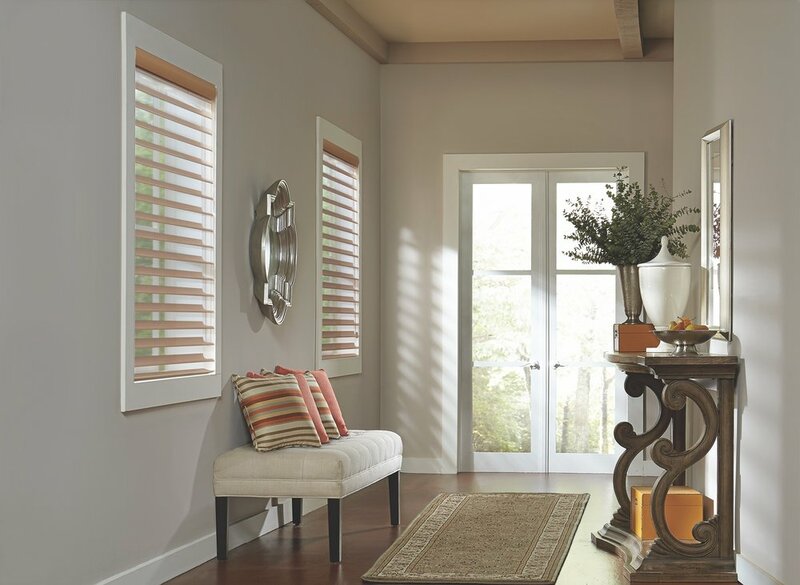 Graber pleated shades filter the sun’s light and create a mood to your living spaces. There are a variety of light control levels, colors, patterns and textures that will match your existing room’s aesthetic. The design prevents sagging and is meant to last a long time in your home. Choose between 1” & 2” pleat sizes as well as control types including cord, cordless, motorized and continuous-loop lift systems. Learn more about EvenPleat® & FashionPleat® Pleated Shades. Graber Roman Shades are the perfect choice for any designer, in nearly any moment. The neutral hues and solid lines of the Graber Fresco® collection is clean and can match nearly any space. The premium fabrics of the Graber Artisan collection offers a sophisticated style that is custom tailored to you and your home. Sheer fabric keeps your space bright while blocking UV rays at the same time. The light filtering shade provides slight light when open and diffuses the light when closed. Sheer shades are available in continuous-loop lift and motorized lift, as well as three vane sizes including 2”, 2 3/4” and 3” vanes. Learn more about Overture Sheer Shades. A versatile and completely stylish choice, the Panel Accents™ Sliding Panels are available in Fresco Roman, Natural , Roller and Solar Shades that fit perfectly for wide windows or patio doors. Multiple fabric options let you control the light that enters the room as well. The Sliding Panel product is offered with two control types which are cord control or wand control, which gives a sleek control option for your window treatments. Learn more about Panel Accents™ Sliding Panels. Lightweaves Solar Shades offer a semi-opaque design that protects against glare and UV rays from St. Louis, Missouri sun. It ensures the perfect balance of light and in-home comfort that you desire. These are perfect for rooms with high sun-exposure. Lightweaves is made as roller shades as well offered in four light control variations as well as control types. Hunter Douglas Shades are innovative and top-of-the-line quality. Engineered precisely, there are multiple solutions that pair perfectly with your St. Louis, Missouri home interior and exterior. Window covering solutions include Duette® Honeycomb, Vignette®, Solera Design Studio Roman Shades, and Roller and Solar shades. Learn more about Hunter Douglas Shades, click the button below to get a free consultation. Duette® Honeycomb Shades are cellular shades that are engineered to provide beautiful and efficient energy savings. The honeycomb construction traps air and creates a natural insulation that helps reduce energy costs, no matter the season. Duette shades are available in multiple pleat sizes, fabrics, colors, opacities and textures. Additionally, the Duette Shades can be controlled by multiple operating systems and custom fit to any window covering. Vignette® Modern Roman Shades have consistent folds and do not expose rear cords. This streamlined design keeps windows looking neat and safe for your family. There are multiple fold styles, sizes and fabrics which are low maintenance. Learn more about Vignette® Modern Roman Shades. Woven and non-woven fabrics make up the Solera Soft Shades®. It embodies a cellular shape and is offered in multiple light control options including room darkening. Learn more about Solera® Soft Shades. The Design Studio™ Roman Shades are offered in multiple fabrics as well as four styles. You can add custom accents including tapes, trims and valances to give a unique look for any room. Learn more about Design Studio™ Roman Shades. The modern look of Cellular, Roller, Screen and Banded Shades ensure your home has a modern look with plenty of light control. Let our consultants at Cardinal Blinds & Shutters LLC point you in the right direction. Learn more now.